After undertaking a major remodeling project of her 1930's Spanish Mediterranean home in Santa Monica, Marla Sobel loved the light, bright, casual and graceful environment of her home. Despite the update of the space, however, Marla's office remained a sort of "catch all" for anything that didn't have a dedicated storage place in the home. 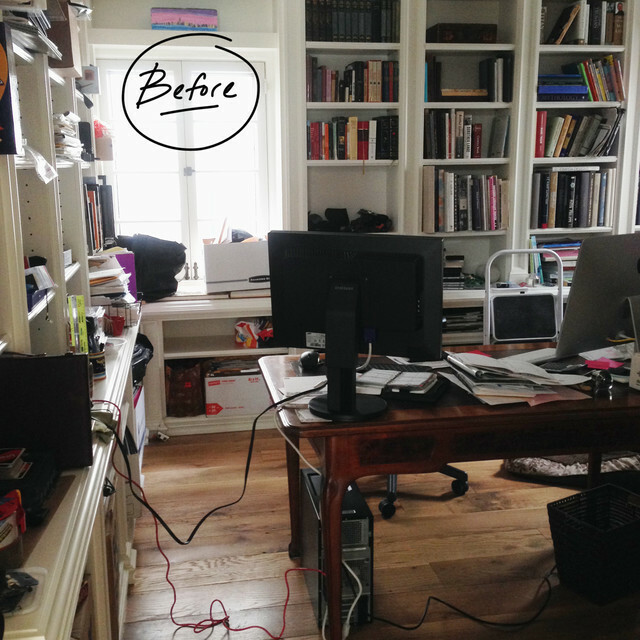 An, "insane mess" as Marla called it; she was ready for a space where she could productively work from home - a place that was multifunctional, beautiful and consistent with the casual elegance of the rest of the house. Well, as you can see, what was once a "catch all" is now completely organized, with Marla's work style in mind. 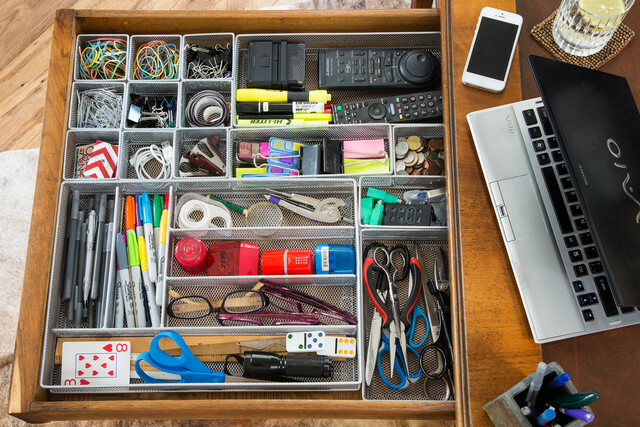 "I wouldn't say I'm the most organized person in the traditional sense, but I do try to contain everything in one spot so I can find items easily," Marla says. We reassured her that everyone has their own approach to organization - there are "pilers" and there are "filers" - and as long as you have an efficient, uncluttered system, you're good! The built-in shelves and cabinetry were original to the space, just modified a bit during the remodel. 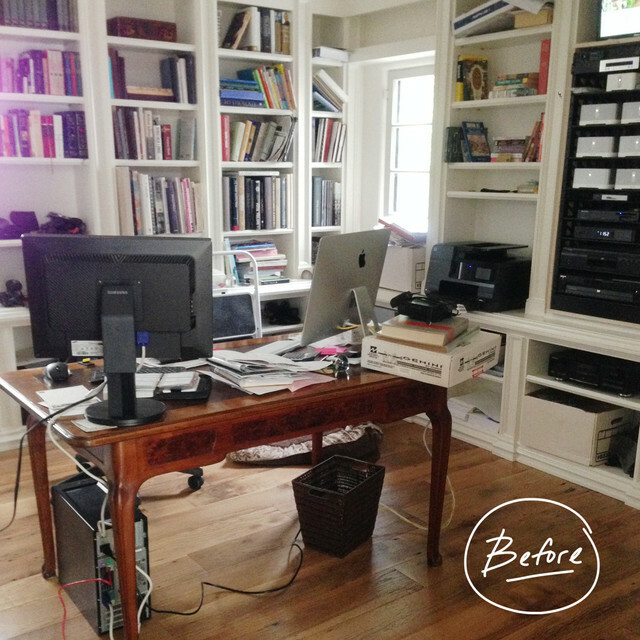 The office needed to not only accommodate Marla's remodeling and construction business work, but also serve as a place where her two daughters' board games could live. A series of woven baskets did the trick, adding a variety of materials to the decor of the room. 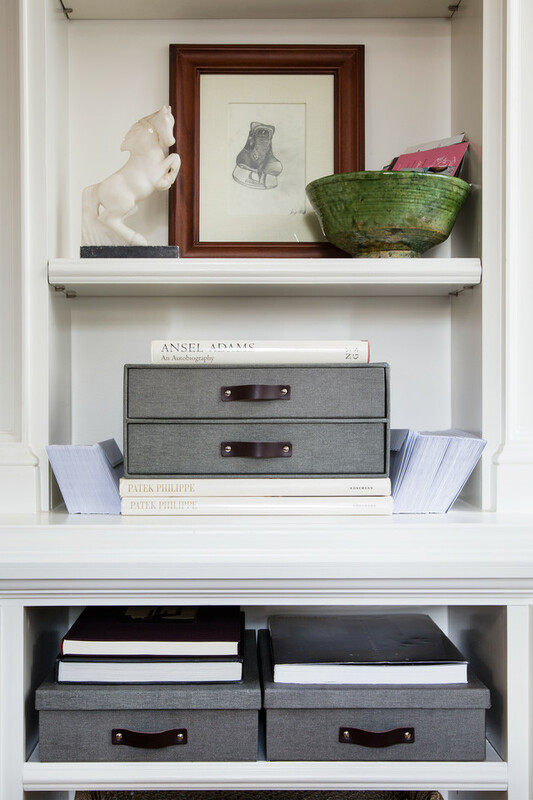 Framed photography collected over the years is sprinkled throughout the space alongside a myriad of art books that the family collects. The late 19th Century French desk was an important focal point in the room. Marla said it was in the space before, but instead of a desk, it became a side table that got "covered in junk" and its beauty was hidden. Now, it's tidy and the centerpiece of the room. Her must haves for her desktop: a notebook to write in ("I'm a very visual person.") and typically, two working computers. Open bins also help compartmentalize the paperwork that can easily pile up. A hide rug underneath the desk was added to give another layer of texture to the space. The set of shelves against the back wall are organized in library fashion by subject matter, where the family of avid readers can easily access them. Husband Drew loves watches and there's a large assortment of various watch catalogs from different periods. The classic, childhood nursery rhymes and storybooks of Marla's daughters Sadye (15) and Sydney (13) are also visible. We're not sure which books Marla's two-rescue beagle mixes enjoy - maybe the cookbook section?! A variety of open and closed bins store away paperwork, electronic cords, office files and supplies. "I think this drawer is the coolest thing in my house," says Marla with a laugh. The desk has a very large ("monster big" as Marla called) main drawer that spans the entire length of the desk. A little custom drawer organization maximized every single inch and gives everything a home! No "insane mess" now Marla! Just an insanely gorgeous workspace!